At some point in societal development, the concept of life after death evolved. The pyramids in Egypt, for example, are a major example, in which the body of a Pharaoh was buried in a place that would secure passage of the spirit through eternity. Bodies were buried with provisions of food, precious gems and metals - all of which would have aided, albeit in a physical way, the spiritual journeys. 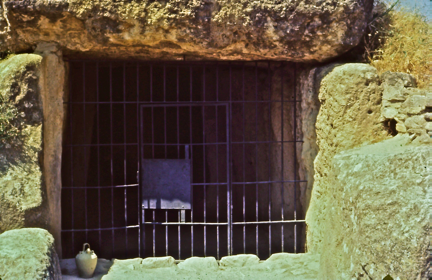 For whatever reason, probably durability in reverence to the concept of eternal life of the spirit, tombs or burial chambers were built to last, and their age seems to indicate that they predate other types of construction, at least with regards to durability. And so our first stop is the outskirts of a little town not mentioned in history books, but one that contains some phenomenal construction. An artificial mound, built to conceal burial chambers beneath. The place: Antequera, Spain. Situated in the Province of Malaga, South of Cordoba and north of Malaga, about midway between Seville and Granada, this town of about 30,000 inhabitants has been continually occupied from pre-historic times, through Roman occupation, followed by Visigoths, Arabs, and Christians. The Andalusia site contains three ancient burial mounds known as dolmens. Of the three, the earliest is about 6,000 years old, while the other two go back about 4000 years. We're talking about the 4th Millennium B.C.E., close to the 5th millennium, a time in which similar types of construction were built as houses for the dead, probably chieftains of local tribes. This custom of burial has been found in scattered sites in England, along the Mediterranean, and in northern parts of Europe. These were tombs, houses for the dead, to be remembered, as a symbol of veneration for the departed chiefs. It's one thing to build a tomb; it's another to create it with stones so massive, it would defy even present-day technology. Francisco López Estrada, writing a Prologue to a treatise on the Dolmens of Antequera, by Simeón Giménez Reyna, speaks of the "primitive Andalusians who (apparently) wanted to leave such a great testimony of their passage through life." This is something we are going to discover and rediscover as we go through the history of architectural things. Estrada speaks with such deserved awe as he questions, "What mighty will of power thought this work? Who managed the men who carried these huge stones? What did they think while performing such a tremendous effort, where they gave body and soul? We remain overwhelmed…." So let's begin by looking at some of these dolmens. 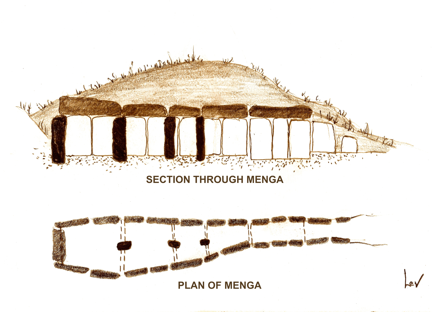 First is Menga, which was discovered as a "cave" as far back as 1645, when Gypsies inhabited it. Gypsies are known to have lived in caves in southern Spain, so this dolmen was thought to be a cave, since it is contained within a hillside. 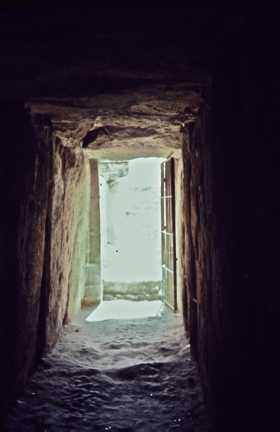 Its main axis, a passageway leading to its entrance, known as a dromos, is 27.5 meters (90 ft.) long. The sides are vertical slabs of stone, capped with horizontals - basic post and lintel construction, but gigantic in size of construction members. 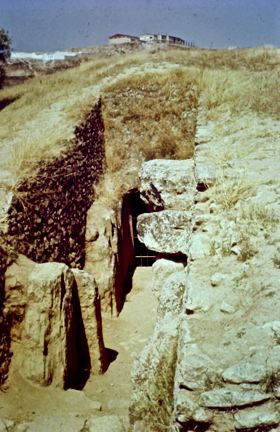 This leads to the burial chamber, the tholos, an oval-like space 6.5 meters (21') at its widest, and roofed by four slabs, the largest of which has been calculated to weigh 180 tons (360,000 pounds or 163,300 kilos). Now, perhaps, the comments by Sr. Estrada above begin to become meaningful. This dolmen was originally presumed to be 4500 years old (2500 B.C.E. ), the oldest of the three in the immediate vicinity. 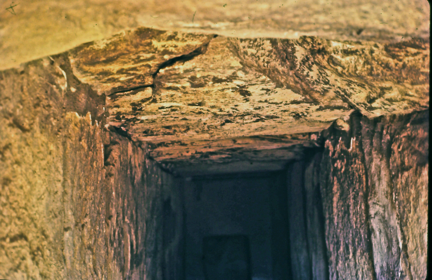 Recent carbon dating carried out at the entrance in 2006 placed construction at 3,790 B.C.E. The mound covering the dolmen is known as a tumulus, and seemingly was man-made of loam and slate, with a diameter of 50 meters (164'). There are anthropomorphic carvings (three "stick" figures) inside the dromos. Seemingly, the only materials used for the work were of stone, not metal. You will note the three independent columns supporting the wider span of overhead megalithic stones (the three dark markings). Individual roof stones. 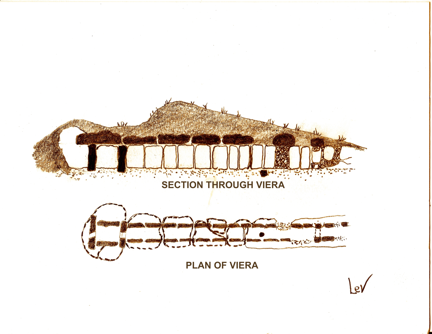 The Viera brothers, for whom it was named, discovered the second cave, dating from about 2,500 to 2,000 B.C.E., in 1905. The dromos is 25 meters (82') long, the width about 1.2 meters (4.0 ft), and the height 1.9 meters (6'-3”). The floor is of rammed earth. 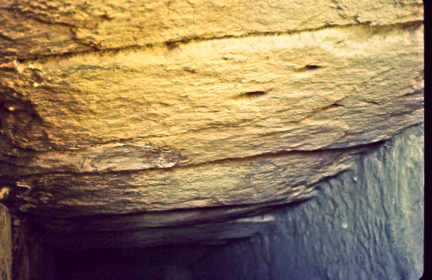 The horizontal roofing stones are over 5 meters in length. 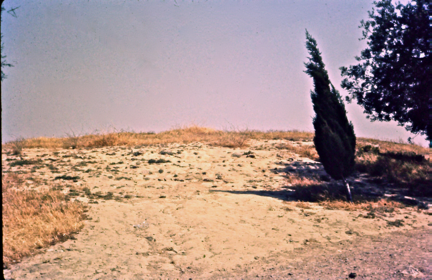 The tholos is centered in a tumulus that is 60 meters (196'-10”) in diameter. In these constructions, the artificial hill is apparently meant to conceal the burial chamber within. 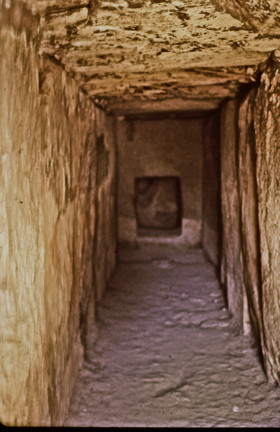 The square burial chamber measures 1.80 m. (6.0 ft.) on a side, and is 1.85 m. high (just under 7.0 ft.). 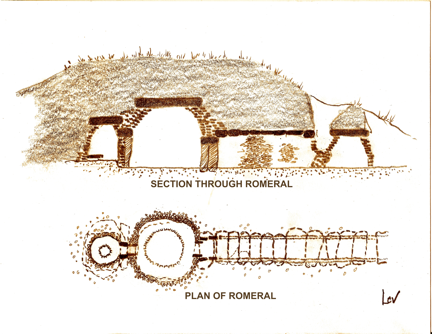 The Viera brothers also discovered the dolmen known as "Romeral" in 1905, a slight distance from the other two. Its dromos is similar, just a bit shorter at 23.5 meters (77'), and 1.5 meters (5') wide. It varies from the other two in its tholos, which is round, 5.2 meters (17') in diameter. It is a vault, constructed by a concentric piling of stones in corbel fashion, topped with a flat slab, and might very well be one of the earliest architectural vaults in Europe. Mortar was used to cement the stones together. Situated off of this chamber is another round, though much smaller chamber, probably a burial vault. Date on this dolmen has been guesstimated at between 1,900 and 1,800 B.C.E. The circular vault of corbeled stones is to become known as a beehive dome, and its most famous example is the Tomb of Agamemnon, better known (though mistakenly) as the "Treasury of Atreus," in Mycenae, Greece (see Chapter Two below). 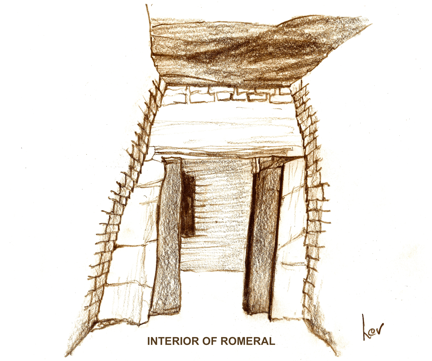 Fascinating about Romeral is that the doorway leading to the main burial chamber has carved (incised) jamb-like creations. It seems that man has been creating artistic effects, integrating art or some form of aesthetics with architecture, for quite a few millennia. 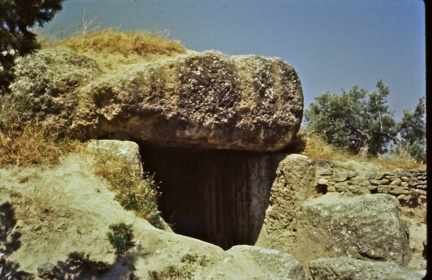 Theories as to origins of the custom of dolmens are not clear, and often contradictory. Some sources indicate European migration towards the Mediterranean; others indicate linkage from the Near East - Mesopotamia, and Mycenae. Question here is - did the dolmens come from, or go to, other areas? Please note that no two sources provide the same measurement for lengths, widths and heights throughout our studies. I have tried to present averages, as I do elsewhere in this text. Personally, I had as one of my University Professors, an architect known as “an architect's architect” - Harry Sternfeld, prolific in the Philadelphia area. He would describe how, as a thesis project through the end of the 19th well into the 20th century, students would travel the world selecting a building to “measure.” He seriously regaled us with escapades of hanging suspended from parapets, precisely measuring buildings. Unfortunately, not everything was measured so accurately.